Zong 4G Bolt Devices 2018 Packages, Subscription & Charges. Zong is offering the 4G internet bolt devices with the seamless connectivity of internet to its customers. Zong is the China based cellular company in Pakistan, headquartered in Islamabad. 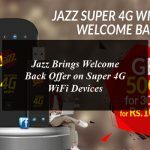 The cellular operator is offering the 4G internet bolt devices WiFi and USB with the high speed of 4G internet connectivity in affordable monthly charges. Today you will find here the complete details or packages, subscription and charges of all the Zong 4G Bolt Devices. All the Zong 4G devices offering the different data packages with the different prices that are too much affordable. Earlier we discuss about the Zong 4G Internet Packages: Daily, Weekly and Monthly that the customers can subscribe from their sims and today customers will have the details regarding the Zong 4G Bolt devices. The cellular operator is offering the three 4G bolt Devices including the Zong 4G Bolt (Huawei), Zong 4G Bolt+ (Huawei) and Zong 4G Bolt+ (Fiber Home). Zong 4G Bolt (Huawei) is a plug and play 4G device that does not includes a battery and you have to connect it with any USB port of your laptop or any mobile charger and it will start operating. You can connects it to upto 10 wifi enabled devices like mobile phones, tablets, laptops, pcs, etc. The Zong 4G Bolt (Huawei) offer the speeds of upto 150 Mbps. Zong 4G Bolt+ (Huawei) is offering the speed and fulfill communication needs that like never before. You can enjoy upto 150 MB speed on the go. The Zong 4G Bolt+ (Huawei) is a portable device and can supports up to 10 WiFi enabled devices with the fastest speed of 4G LTE. It has a rechargeable 3.8 V 1500 mAh lithium Battery that offer 6 hours of working time with the 300 hours stand by time. Zong 4G Bolt+ (Fiber Home) is offering the speed and fulfill communication needs that like never before. You can enjoy upto 150 MB speed on the go. The Zong 4G Bolt+ (Fiber Home) is a portable device and can supports up to 10 WiFi enabled devices with the fastest speed of 4G LTE. It has a rechargeable 3.8 V 2100 mAh lithium Battery that offer 8 hours of working time with the 40 hours stand by time. You can buy Zong 4G Bolt from your nearest Zong Service Centers, Franchise and selected retailers. For more information you can visit the Zong official website. Complete Details about Zong 4G Bolt Devices 2018 Including Packages, Subscription and Charges. Zong 4G Bolt Devices 2018 Packages, Subscription & Charges.